POEPR is a program for recovering ALL types of Outlook Express passwords: SMTP, POP3, IMAP, NNTP, HTTPMAIL, LDAP, and Identity passwords. It's simple and user-friendly wizard interface will help you choose between two recovery modes: automatic (decrypt passwords of the current user account) and manual (extract passwords directly from Windows registry files). Passcape Outlook Express Password can also reveal asterisks passwords. 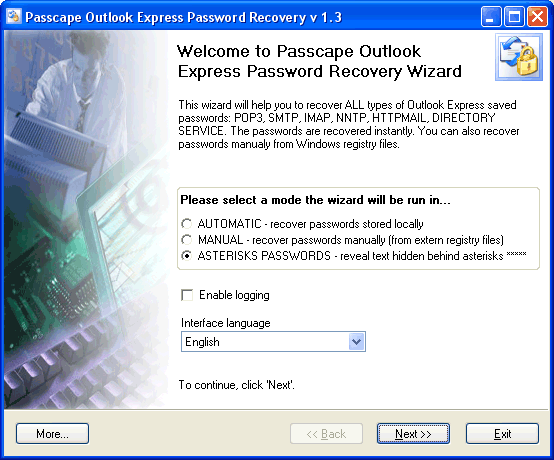 Restore passwords and MS Outlook Express identity password. Qweas is providing links to Passcape Outlook Express Password 1.11.0 as a courtesy, and makes no representations regarding Passcape Outlook Express Password or any other applications or any information related thereto. Any questions, complaints or claims regarding this application Passcape Outlook Express Password 1.11.0 must be directed to the appropriate software vendor. You may click the publisher link of Passcape Outlook Express Password on the top of this page to get more details about the vendor.